One of my regular themes. How even in a marginalized community we still find ways to further denigrate those unlike us. 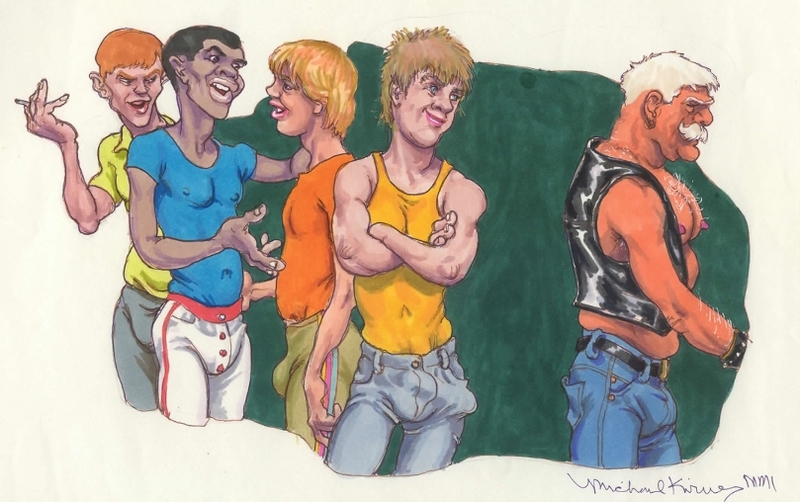 This was a 'Beginner's Luck' installment that dealt with how a young queer is 'closeted' about his attraction to older dudes when he's with his peer group who are revolted by 'old men.' I like the way our hero manages to admire the gentleman even as his companions mock the guy. He's going to make the right choice. Generation Gap — 2001 — 6" x 10"
Any images, writings or other content on this website may be copied for personal viewing only. nor used for any other purpose without the express written permission of the artist or KirwanArts.com.